There is a way for news organizations that have grown and thrived under legacy models to survive – they have to drop it. That, in a nutshell, is the message that Deseret News CEO Clark Gilbert gave during his keynote panel at the first session of the International Symposium on Online Journalism on Friday April 19. Gilbert, a former professor at Harvard’s Business School and author of the article “Two Routes to Resilience,” spoke about his decade-long research on disruptive change in the news industry. See an interview with Gilbert in this video. According to the disruptive model, there is a pattern that happens over and over again when a disruptive innovation enters a market: First, an underserved demand precedes what legacy brands are offering. Then, scruffy innovators start responding to the demand, under the radar and scoffed by the legacy brands. Eventually, the disruptors begin competing head to toe with the incumbents and, after one final gasp, the incumbent industry goes into decline. “One day, (the disruptive businesses) seem to be working faster and displace the companies that used to be paragons of industry,” he said. It happened during the rise of the minicomputer business — which displaced the mainframe computer — and it’s happening now with legacy media and digital native news outlets. For established businesses, it is difficult to avoid the dip. Gilbert said only 9 percent of companies survive the disruption of their industries. However, all of those survivors, without exception, pulled through by setting up separate units to develop disruptive branches. Part of the challenge of surviving a disruptive innovation in the market is that incumbent businesses often insist in seeing the changing world through the lens of the established model. And the adaptation is not without a confrontation between the old model and the demands of the new world, he said. At Deseret News, Gilbert couldn’t ignore editorial voices calling to highlight content on their websites based on journalistic priorities on the one hand, and, on the other, calls for content optimization based on traffic generated by other features. That was the subject of a confrontation between his news editor and social media editor. At the end, the compromise was: Reserve the first two content positions of the home page exclusively to hard news and enterprise features, positions three, four and five can be allocated to any kind of content based on performance, and position six goes to lists, a popular feature on the site. In the panel that followed, members of the news industry also spoke about how they have been coping with disruptive innovation. Jennifer Carroll, vice president of digital outreach for Gannett, said the company has moved the digital unit away from the traditional structure. Jim Brady, editor-in-chief of Digital First Media and president of the Online News Association, said he has centralized non-local news editing and web production, and begin spending money on boots on the ground covering local stories. And Jim Moroney, publisher & CEO of The Dallas Morning News and chairman of the board for Newspaper Association of America (NAA), said their strategy has been to diversify their sources of revenue by investing on new businesses to sustain quality journalism. Most importantly for any news group, Gilbert said, is to choose areas of emphasis. For Salt Lake-based Deseret News, for instance, it was family and community. “Newsrooms have to ask themselves what they can be uniquely good at,” he said. Patrick Howe, an assistant professor of journalism at California Polytechnic State University, said it’s worrying to see brands being used for selling products outside of news but that it’s a model worth exploring to sustain the industry. Freelance reporter Nathan Frandino contributed to this article. 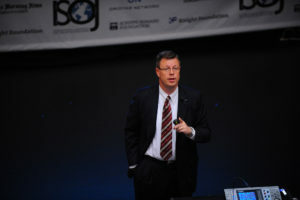 ISOJ 2013: Clark Gilbert presents keynote at the 14th International Symposium on Online Journalism, from Knight Center on Vimeo.